The exhibition Souls and Machines explores the fact that, at the beginning of the 21st century, art and science move along parallel paths. And it does this through the work of a group of artists chosen for their ability to combine art, technology, mystery and beauty. Its first presentation at the Reina Sofia Museum of Modern Art in Madrid drew more than 451.000 visitors, making it, arguably, the most visited exhibition of digital art up to date. It was exhibited during four months in the summer of 2008. The crucial element in the new technological discontinuity is our humanity. Without it, everything else lacks meaning. Computers do not think; they replicate our thoughts. They do not feel; they replicate our emotions. As Sherry Turkle described them, they are the psychological mirror we gaze into. “Souls and Machines” also maps the main conceptual strategies and routes crisscrossing the vast, interdisciplinary territory of new media. Through disciplines like robotics, software art and social tools for the web, information visualisation or biotechnologies, we encounter issues like the new dimensions of identity, privacy and control on the internet, the transformation of the concepts of property and collaboration, or the fascination for reproducing the mechanisms of life and intelligence. The names featured in the exhibition stand at a very specific crossroads. In a way, they represent a generation of creators – not only artists – who have defined the limits of the discourse of new media, taking them beyond their speculative beginnings and constructing their strategic and linguistic bases. Their voices have grown in parallel to the expansion of the hybrid, fascinating space they inhabit. Since 1990 Theo Jansen is working on a new nature. All those who observe for the fist time the beauty of one of his creatures understand immediately that the work of this engineer, scientist and artist is something special. They were born inside a computer as an algorithm, but they do not require engines, sensors or any other type of advanced technology in order to walk.They move thanks to the force of the wind they find in their habitat of the Dutch coast. The extraordinary techniques that Sachiko Kodama uses in her projects have no precedent in contemporary art practices, either within or outside the realm of digital art. Her work illustrates how scientific research can expand the expressive vocabulary of artists today. 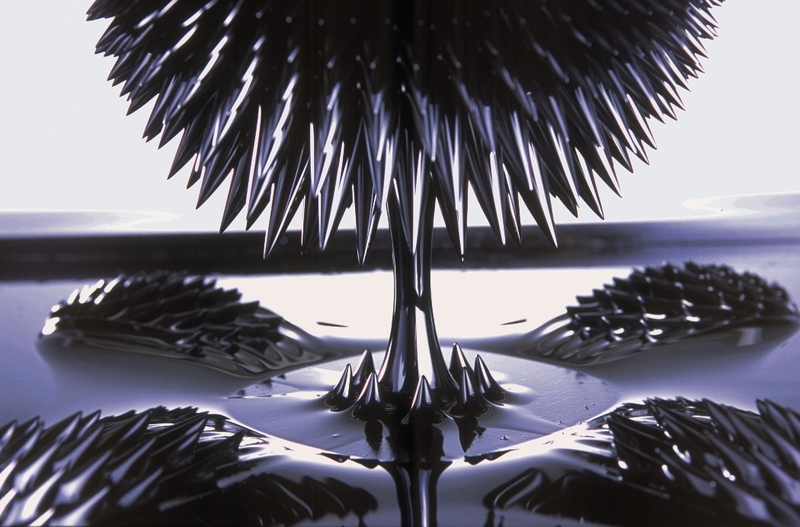 Kodama’s projects are based on the study and manipulation of specific substances, ferrofluids, whose visual properties seem almost magical. New York artist Ben Rubin and scientist Mark Hansen, a statistics professor at UCLA and an expert in environmental sensor networks, explore the creation of systems to visualise the processes and dynamics underpinning the net society, revealing information architectures which literally keep the world up and running. Although David Byrne is best known for his musical career as the principal member of the legendary band Talking Heads, over the last two decades he has also pursued a prolific career as a photographer, film director and visual and sound artist. From this multidisciplinary position, Byrne has explored how media technologies are used to construct the aesthetics that identify political and economic power. David Hanson is the founder of Hanson Robotics, an innovative company that creates anthropomorphic robots capable of reproducing human facial expressions and understanding oral language. For over 15 years, the group Amorphic Robot Works, founded by Chico MacMurtrie, an artist from New Mexico, has been creating anthropomorphic and animal-like robotic sculptures for use in its installations and performances to express the dilemmas and conflicts of the human condition through the sculptures’ movements. Paul Friedlander has spent more than two decades researching all kinds of technologies and systems in an attempt to turn light into a malleable, flexible material capable of taking on any form and volume. His “kinetic light sculptures” are clearly influenced by the work of other great figures who have preceded him in the art of light or moving structures, from László Moholy-Nagy to Flavin and Turrell. 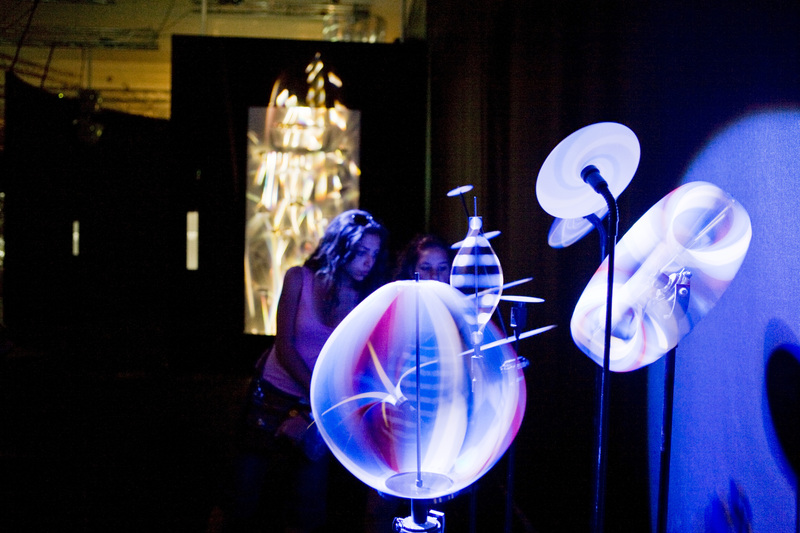 Daniel Rozin creates interactive installations and sculptures that have the unique ability to change and respond to the presence of a viewer. Although computers are often used in his work they are seldom visible. Mirrors and mediated perception of the self are central themes in Rozin’s work. In most of his pieces, the viewer takes part, actively and creatively, in the performance of his art. Daniel Canogar’s work sits midway between the scientific and the humanist in that it explores the way in which our senses adapt to the new space/time coordinates of the electronic revolution. His work transcends photography. Light plays a fundamental role, as does the figurative representation of the body, both elements placing him in a fairly equidistant position between photography and painting. 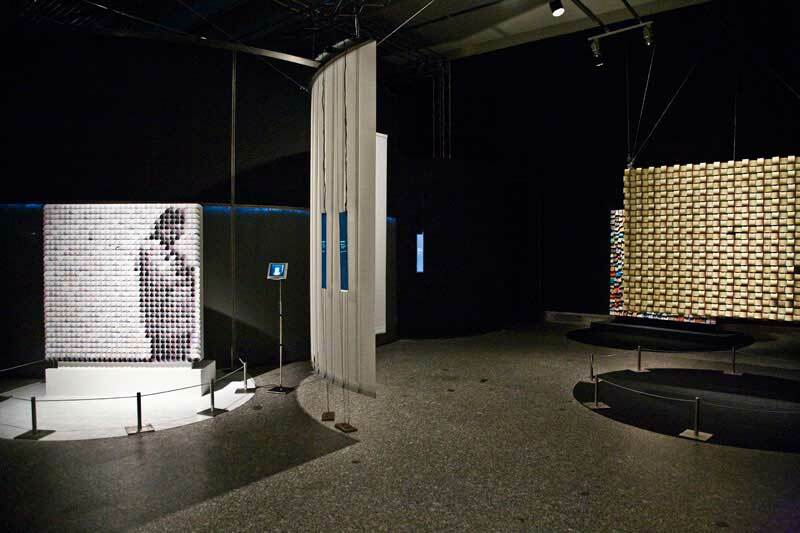 As an electronic artist, Rafael Lozano-Hemmer emerged producing large-scale interactive installations in public spaces, usually deploying new technologies and custom-made physical interfaces. Using robotics, projections, sound, internet and cell-phone links, sensors and other devices, his installations aim to provide “temporary anti-monuments for alien agency”. The Serbian artist Vuk Ćosić was one of the first artists to use the net and the person who coined the term net.art. He is best known for his work involving the ASCII code, a medium he has used in numerous projects to explore the low-tech aesthetic, the ecology and archaeology of the media, and the intersections between the language of text and the computer code. During the last two decades, the Japanese-American artist, designer and educator John Maeda has been one of the most important figures to explore the artistic and visual potential of the computer as a tool and computer code as working material. 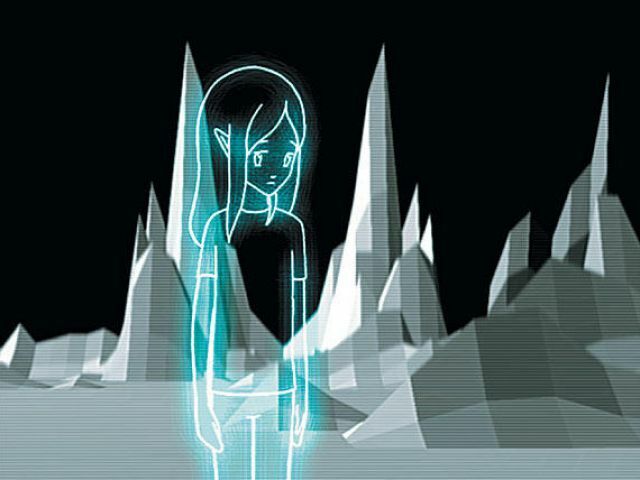 From his position as founder of the fundamental Aesthetics and Computation Group of the MIT Media Lab (1996-2003), Maeda has promoted a humanistic approach to technology that reconsiders our relationship with the digital media. Evru (born Alberto Porta, known as Zush from 1968 and later Evru from 2001) has followed a decidedly personal career path in which all other concepts are subordinate to his determination to depict a reality that he himself has conceptualised in the Evrugo Mental State. Few artists can boast their own state, complete with a flag, postal stamps and paper currency, yet this is true of Evru and his Evrugo Mental State. “No Ghost Just a Shell” was initiated by Philippe Parreno and Pierre Huyghe in 1999. They acquired the copyright for a figure called ‘Annlee’ and her original image from the Japanese agency “Kworks”, which develops figures (almost actors) for cartoons, comic strips, advertising and video games of the booming Japanese Manga industry. 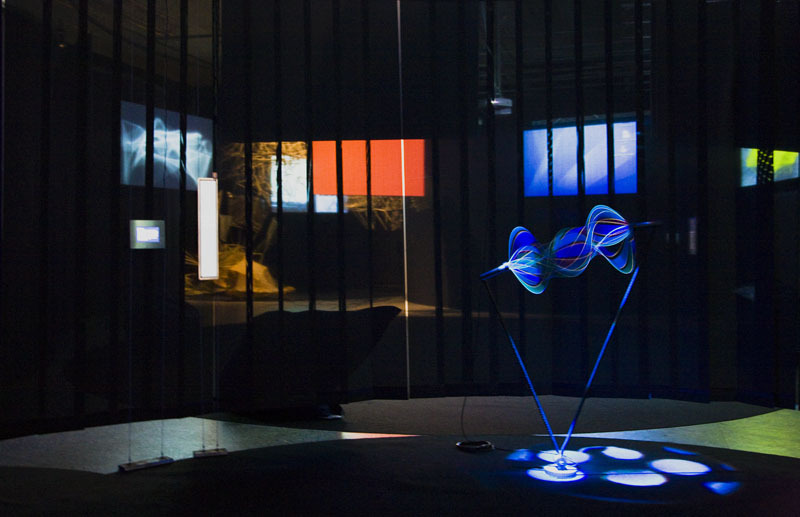 The Lleida-born artist Antoni Abad has spent his extensive career exploring the artistic possibilities of the interactive media and communication networks. In 2003 he began his project Zexe.net, which focuses on the creation of digital communities by using mobile telephones equipped with built-in cameras. Antoni Muntadas is one of the most important names in Spanish art of the last four decades. His work investigates issues revolving around communication in the social and political arena and examines the way in which channels of information are used to promote or censure ideas. Natalie Jeremijenko, engineer, artist and designer, explores different strategies to claim the use of technology as a tool for political and social intervention. The UrbanSpaceStation (USS) is a device designed to sequester the carbon dioxide emissions from buildings and return oxygen-enriched air to the building. In his documentaries, films and video installations, the German filmmaker and artist Harun Farocki explore the ways in which film and other image technologies affect and modify our understanding of the world. His works address themes such as consumerism, war and the politics of the image. Art must flow constantly to maintain its strength. And when the media through which it is expressed do not expand, almost by art of magic, it finds new channels that take it to a higher level. Flanders, mid-15th century. Bruges. An enormous megapolis with over 45,000 inhabitants, reborn thanks to the wool trade. This is a historic moment. The appearance of a new technology – the printing press – will shake all of Europe. Private citizens will be able to store up knowledge and a new social class will emerge: an educated class, neither clergymen nor aristocrats, consisting of craftsmen and merchants. Jan Van Eyck and his brother Hubert, with the commercial patronage of the Duke of Burgundy, stumble upon a new glazing technique in oil paint. By mixing the new pigments directly with linseed and walnut oil, they achieve what tempera paint had never been able to do. The brush slides almost magically, generating glazes and colours never seen before. Jan paints a portrait of the Arnolfinis, a prosperous Italian merchant couple; and he signs, ahead of his time, like a true graffiti artist: “Johannes de Eyck fuit hic 1434.” Just above the mirror. Virtual spaces of two-dimensional perspective. Would the Italian Renaissance and the Spanish Golden Age have been the same without the creative genius of Leonardo and Velázquez? Undoubtedly no. Would they have been the same without the Van Eyck brothers, chance and the new technologies of the time? No again. In a few short decades, oil painting would spread like wildfire across the Old Continent. Barcelona. January 1990. The multiple combinations of fate crash crazily into each other like neutrons escaping from the nucleus. Eighteen years ago, when we began that vague project called ArtFutura, the Internet as we now know it didn’t even exist. Tim Berners-Lee was still designing his World Wide Web and the scientific community who used the network barely outnumbered 100,000 people. A village. Festivals like Ars Electronica and conferences like Siggraph created a new awareness in the art community and lead to the birth of festivals like ArtFutura, inspired by a new technology called Virtual Reality and guided by the ideas of a writer named William Gibson. William visited Barcelona several times with his entire family (nanny included) and dedicated more time to Gaudí’s work and the long nights at the bar “El Otro” than to his new book-in-progress, The Difference Engine. An alternative novel – co-written with Bruce Sterling – that tells how the English scientist Charles Babbage could have realised his project for the Difference Engine. Something that would have altered the course of history and launched the digital revolution over one hundred and twenty years earlier. London, summer of 1940. The “Eagle Day” operation begins. The German Luftwaffe perpetrates a massive bombing raid on airfields in English territory. On the 24th of August – some say by mistake – several bombs fall in central London. Two days later, Churchill orders the Royal Air Force to attack Berlin. The reprisals against the civilian population begin. Terror is served. That same year, a British research group called Ultra creates the first totally electronic computer with the participation of Alan Turing and based on the experiences of Babbage, Byron and Boole. The computer is dubbed “Robinson” and it is designed to decode the German messages generated by Enigma, a cutting-edge cipher machine. Three years later the same group will develop the “Colossus,” which uses electronic tubes and runs one thousand times faster than the “Robinson.” The German messages are completely deciphered. The machine will play a decisive role in determining the war’s outcome. Seven years pass and, in the middle of the Cold War, the first transistor appears. It is 1947 and the world is captivated by the popularity of a new medium – the television. But it would not be until the 1970s that computers reach a new level with the microchip. Goodbye tubes, goodbye transistors; from now on we will have a new magical element at our fingertips. In April 1976, Steve Jobs and Stephen Wozniak – from a garage in Los Altos, California – found a new company bearing the same name as the Beatles’ record label. Their first project, the Apple I, is considered the first fully equipped personal computer in history. Jobs and Wozniak market 200 units. And they sell. One year later they introduce the Apple II, the machine that will change the world. They end up selling millions of units and putting technology in the hands of individual citizens, who are now able to store knowledge – and process it. Four years later, in 1981, IBM itroduces its own personal computer (PC) on the market. Over the next twelve years, personal computers would spread around the globe, exponentially multiply their processing speed and be put to a wide variety of uses. In the early 1990s, with the appearance of the World Wide Web, a new era is ushered in: in another twelve years, the number of Internet users would jump from one hundred thousand to 1.2 billion. February 2007, the sun rises in Trancoso, Brazil. An old fishing village on the coast of Bahia. Unspoiled beaches, golden sands, mangroves and palm trees as far as the eye can see. It is summer high season, right around when Sao Paulo’s tourists invade their beaches. Beside the Quadrado – the square built by the Portuguese four hundred years ago – is the local cybercafé, full of tourists eager to read their e-mails. Supposedly they are on holiday, but the cybercafé is something more than a computer and a cable that regularly fails. It is a social space. Where you say hello, where you exchange information, where you meet people. From the offices-with-a-view of Wall Street’s skyscrapers to the narrow streets of Singapore’s Chinatown, from the nameless telephone booths in Madrid to the tropical cybercafé of Trancoso, computer networks complete and broaden our senses. They multiply ourselves and generate parallel lives. 1.4 billion human beings latched on to the udder of global knowledge and the endless chat. Machines that express emotions previously unknown to us. Emotions. Machines and emotions. Virtual spaces of three-dimensional perspective. The computer goes beyond the industrial machine. Its ability to process information and its ubiquity have made of it a constant companion in practically every area of our lives. An industrial machine repeats mechanically the same function, but the computer’s virtuality makes its codes and its functions infinite. And the crucial element in the new technological discontinuity is our humanity. Without it, everything else is meaningless. Computers do NOT think. They replicate thoughts. Computers do NOT feel. They replicate our emotions. They are, in effect, the psychological mirror in which we see ourselves reflected – mirrors where we play, where we feel, where we stretch our imagination, and also where we learn. Mirrors. And what about souls? Can they be replicated? Here and now. Hakuin developed his painting style in the final years of his life, after he had already turned sixty. He created over one thousand paintings and calligraphies in twenty-odd years in such a wide diversity of styles that it is often hard to believe they were made by the same person. Hakuin was famous for breaking out into fits of laughter during his enlightenment experiences. He once said, “Meditation in the midst of activity is a thousand times superior to meditation in stillness.” In other words, inspiration should come while you are working. This was well ahead of his time. No wonder he burst out laughing. June 2008, Madrid. Museo Reina Sofía. 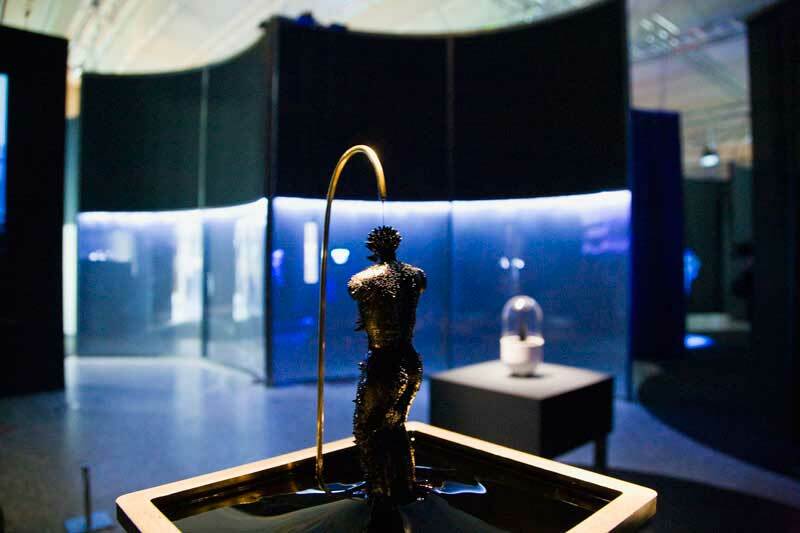 The exhibition “Souls & Machines” attempts to explore the fact that, at the dawn of the 21st century, art and science are travelling parallel paths. And it achieves this through the work of a group of artists selected for their ability to combine art, technology, mystery, emotion and beauty. All of them use digital technology as a tool in multiple ways: as a medium, as a developing element, as a research method or as springboard to new sensibilities. But their computers themselves do NOT create. And without the emotion and creativity of its authors, digital art is nothing. It would be like talking to a mirror. Sachiko, Paul, David, Theo, Rafael, Antoni, John, Evru, Pierre, Daniel, Vuk, Ben, Chico, Natalie… working from Tokyo, London, New York, Delft, Vancouver, Barcelona, Boston, Paris, Madrid, Ljubljana, San Francisco… they amaze me, they make me think, discover, ask questions, investigate, they make me feel, they move me… in a new way. Virtual spaces of infinite perspective. Here and now. Paris in the 1920s. New York in the sixties. The capitals of art also pick up and move with their luggage, their artists, their galleries and their museums. But how do Internet and digital technology affect the art world? At the beginning of the 21st century, the neurological centre of the new Cultureburg seems a bit confused. It is no longer necessary to walk the streets of Montmartre or the New York Soho to feel like an artist. We can’t even say that West Chelsea is the new global node. It isn’t. The centres and nodes have multiplied and are everywhere, from Shanghai to Berlin, from London to Tokyo, Barcelona, Los Angeles, Moscow… we are all here. Why is it that we need new stimuli to move us in a new way? The present constantly demands new ways of feeling, of asserting that we are alive. Virtual reality, Internet, social networks, synthetic images, artificial life… these are just the tip of the iceberg. The world we know will transform even more rapidly in the coming years. Our museums will be different, our art will be different, our ideas, our lives and our relationships will be different. It is the vital impulse that drives us to generate new forms and new experiences, to grasp reality in a broader, more real way. Because, at the end of the adventure, that is what we are: souls yearning for new experiences and new emotions. Here and now. institution and a peripheral yet tremendously active field of production. Over the course of nearly four decades, these two elements have maintained a complex relationship, characterised by mutual incomprehension as well as necessity and investigation. The museum’s fascination and interest in approaching and assimilating the discourses and strategies that have emerged in the area of new media is no longer a novelty. This exhibition has arrived after a period of several years in which the major fairs, biennials and impressive new centres, driven by political motives, have made efforts to legitimise digital arts, with varying degrees of success. Their interest may be genuine, but their methods have failed to address and assimilate the crises and short-circuits that these arts produce, and they have not sought answers to or seriously considered the questions they pose. Some of these stances reveal that, in many cases, interest has not been accompanied by an understanding of its keys and basic principles. Despite their efforts, the assertion that art institutions can assimilate new media art in the same ways and with the same strategies that they have used with other artistic languages is debatable, to say the least. on activities requiring personal attendance (festivals, conferences) and education and production initiatives (workshops, research programmes, university posts). In this context, the transference of objects continues to play a marginal role. In addition, as much as all of the parties involved—artists, centres and gallerists alike—try to forget it, the specific characteristics of these languages threaten structural principles that are fundamental in the cultural context of contemporary art. It is difficult to apply the economy of artificial shortage to works that only exist as software, a medium in which concepts such as original, copy and series have no meaning. Other more objectual lines of work, such as interactive installations or robotics projects, pose another set of problems. Accustomed to having a relatively stable and predictable relationship with technology, it doesn’t usually occur to us that the projects created by artists who work with this medium are actually more like prototypes than products. The creators do not represent an industry, and they do not have industrial standardisation and intensive testing procedures. Thus, in many cases these pieces are fragile and very hard to maintain. present or the utopian projection toward tomorrow. This search has materialised in the birth of academic disciplines such as media archaeology, practised by individuals such as Erkki Huhtamo or Siegfried Zielinksi, the celebration of events such as the symposia series Refresh! and Replace, on the origins of media art, and exhibitions such as Feedback (one of the inaugural shows at the LABoral centre in Gijón), Automatic Update at the MoMA or the exhibits held at recent editions of the Berlin festival Transmediale. All of these developments represent attempts to draw an unbroken and logical line connecting 20th-century art movements and schools with the creative forms that emerged from the shock wave of information and communication technologies. name 9 Evenings in 1966, the exhibition Cybernetic Serendipity (1968) at the London ICA or, in Spain, the work of the Computing Centre at the Complutense University of Madrid, also in 1966. Numerous theoretical bridges have also been built between contemporary art and digital art in its multiple forms through paternity claims that link the strategies and modes of action of the new media to the work of artists as diverse as Oskar Fischlinger, Sol Lewitt, Moholy-Nagy and Muybridge, to name but a few. 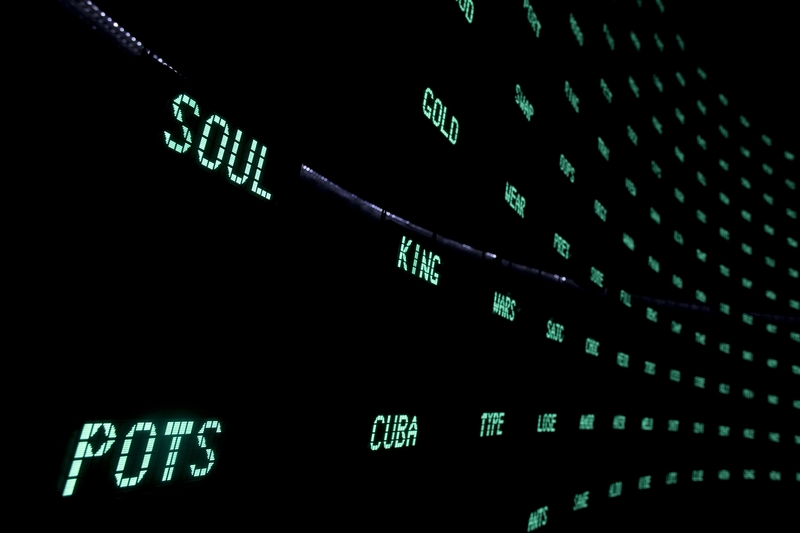 Based on these coordinates, Souls and Machines is not a historical exhibition that aims to create a linear, all-encompassing genealogy—something that would not only be impossible but also absurd in such a hybrid and interdisciplinary space of production. Yet, at the same time, the museum tempo requires a narration of the history of the transformations that underlie the practices of these artists, of the radical impulses that have motivated their work. The artists included in the exhibition are located at a very specific crossroad. In a way, they represent the second generation that has defined the boundaries of the medium discourse, those who have propelled it forward from its speculative beginnings and cemented the bases of its strategies and languages. Throughout their prolonged careers, these artists have developed their voice and, at the same time, the cultural territory they travelled. Their work is a testimony to the relevance and maturity of languages that are called to pave the way for the transformation of 20th-century art into 21st century art. order to precisely control the liquid’s response. from the plate, forming three-dimensional shapes that mutate every second. Curiously, these images do not seem entirely strange to us. They remind us of the synthetic images generated by computers, with their shiny surfaces and ability to change volume and shape in a single second. This approximation to virtual aesthetics through the use of a physical substance we can see directly before us is one of the most intriguing aspects of this project. 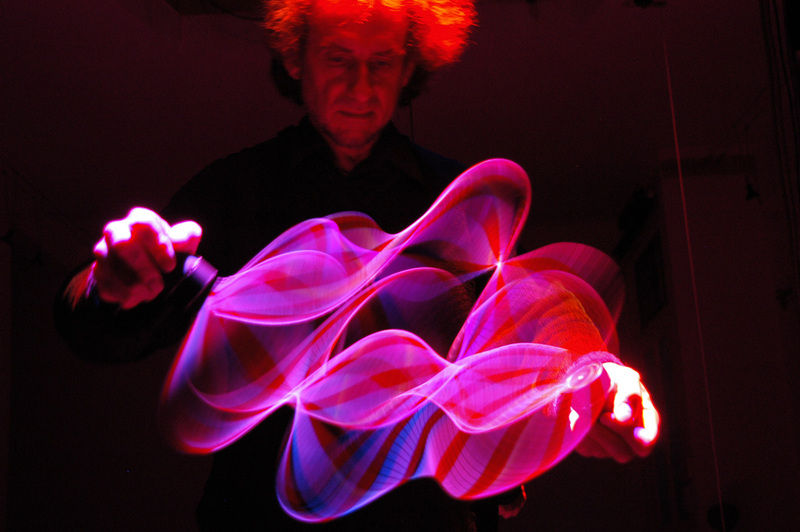 Paul Friedlander has spent more than two decades investigating all kinds of technologies and procedures with the goal of making light a malleable and flexible material that can take on any shape or volume. Friedlander’s “kinetic light sculptures” owe much to the work of other great names that preceded him in the field of light or kinetic art, from László Moholy-Nagy to Flavin or Turrell, using computer lighting control systems to enhance the impression of incorporeity and dynamism that his sculptures give. 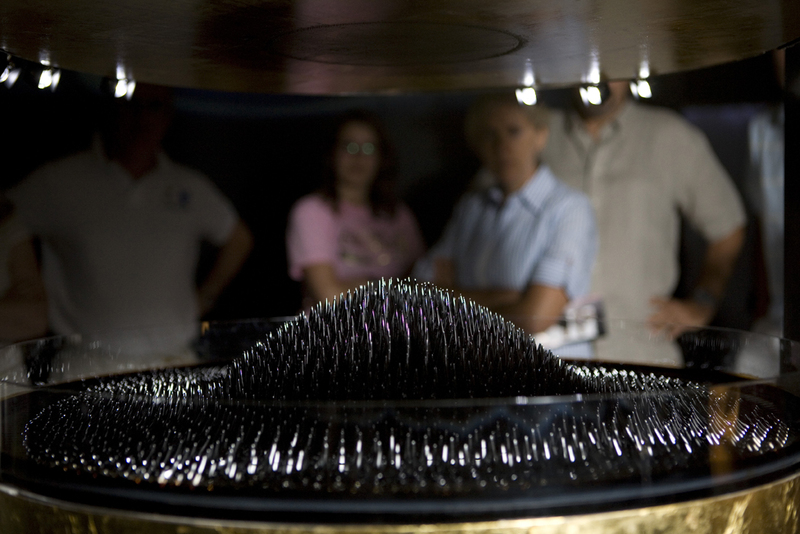 Although works like The Wave Equation or The Energy Core are not strictly holograms, what the observer discovers when standing before them are large incorporeal shapes in motion, suspended in mid-air, and when they spin around they give light a three-dimensionality we are unaccustomed to seeing in the proximate physical space. and the magical. After all, the physical elements that comprise Friedlander’s sculptures remain veiled by the mystery of a basic yet impressive optical effect. Like many other artists who have pursued a career at the intersection of art, science and technology, Friedlander situates his work in a hybrid space. On the one hand, his works rely on the extensive tradition of kinetic art in the 20th century, which he does not hesitate to claim. Yet on the other hand, this British artist cannot separate his experience from the field of large-scale stage lighting where his career began and which, in recent decades, has been a decisive factor in the progress of illumination technology. The visual legacy of the former and the procedures of the latter have allowed Friedlander to develop an instantly recognisable body of work. The work of Kodama and Friedlander is an example of how scientific research can expand the expressive vocabulary of present-day artists, allowing them to mould physical reality and create images that we once would have thought possible only in the realm of imagination and dreams. foundational theories of cybernetics and the study of complex systems, a revolution that led directly to the implantation of the computer as a “universal systems machine” at every economic, political, scientific and military level, and to the development of man-computer inter-face protocols. The criticism and study of the language of interaction largely dominated theoretical reflections on the new media throughout the 1990s. At its most basic level, the interaction between a person and a computer system consists of involving both in a shared dynamic process; however, few artists have examined this phenomenon as closely as Daniel Rozin. genres such as portraits, and perpetuating the tradition of kinetic sculpture, Rozin creates pieces in which technology remains hidden to preserve the mystery and magic of an experience that seems impossible at first glance. Rozin develops sophisticated interactive installations that are able to change shape and respond to the presence of the spectator. In some of them, the spectator is actually the theme of the piece; in others, his active participation is required in order for the piece to make sense. The subject’s self-perception is the most commonly recurring theme in Rozin’s work, and it is most often formalised through the use of a mirror. phantasmagoria of the 17th century, a proto-cinematographic show that used magic lanterns to create spectral figures. ray of light seems to make the burnt-out bulbs come alive again. The presence of the audience metaphorically gives them back their brilliance. As in the past, our modern-day digital phantoms continue to bewitch us. The effects of the legacy of cybernetics as an agent of transformation and the impact of computer technologies on society are other primary concerns that have been addressed by new media artists, who have striven to imagine ways of presenting the dilemmas and situations that these technologies generate to the public. In their projects, Ben Rubin and Mark Hansen have explored the creation of systems that visualise the underlying processes and dynamics of the Net society and have worked to reveal the architectures of information which, thanks to the omnipresence of computer code at every level of society, literally keep the world running. For the new media critic Lev Manovich, the predominant cultural form of the 21st century (the successor to the novel and the cinema as a vehicle that will serve to portray an era) will be the database. Generating and classifying these great masses of information has become one of the primary activities of science, economy and, after the web took off, civil society. Rubin and Hansen’s work is a fascinating call for a new language that will allow us to examine and interpret this data. 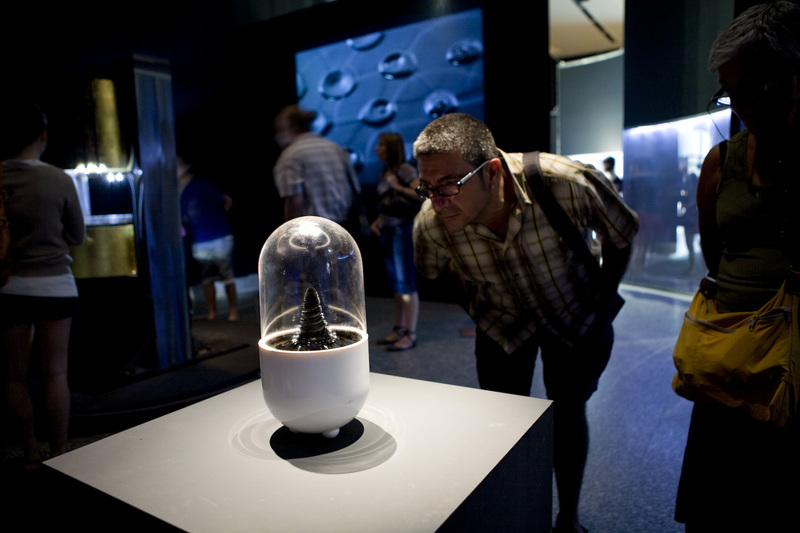 the search for its essence using diverse strategies have generated veritable “life form arts,” which range from the digital simulation of autonomous organisms (“artificial life”) begun in the early 1990s to forms of robotics and the ample series of experiments made in bioart, genetics and transgenics. This recurring preoccupation is reflected in the exhibition by the work of Amorphic Robot Works and Theo Jansen. For more than fifteen years, the New York collective Amorphic Robot Works founded by the New Mexican artist Chico McMurtrie has been creating animal and anthropomorphic robotic sculptures that are used in their installations and performances to express, through their movements, dilemmas and conflicts of the human condition. In the early years of his career, McMurtrie created mechanised humanoid sculptures that he controlled remotely by radio, inspired by the tradition of 19th-century automatons and incorporating special-effects techniques from the film industry, with the goal of creating a new kind of kinetic sculpture that incorporated dramatic elements thanks to its sequences of motion. Amorphic Robot Works drew progressively closer to digital technologies in order to give their creatures autonomy and the ability to make independent decisions. For McMurtrie, the primary consequence of being replaced by a computer in the process of bringing his creatures to life was shifting the emotional focus of his work from the artist to the public who, in their interaction with the piece, play a large part in determining its behaviour and therefore have a unique experience in every case. In The Tumbling Man, two different users attempt to control the same robot by means of electronic sensors. However, the participants do not know which one is controlling the robot’s arms or legs; this is decided by the computer, which obligates the participants to engage in a constant renegotiation of the situation. They are active elements in a process that forces them to become more than mere spectators. Skeletal Reflections is a featureless, skinless anthropomorphic robot that represents the essence of the human figure. Acting as a kind of mirror, the robot registers the gestures of visitors and, when interpreting them, adopts poses that have been canonised in art history as the greatest expressions of the beauty of the human body. In their latest productions, such as the piece created specifically for Souls & Machines, Amorphic Robot Works have embarked upon a new line of research, eliminating metal as the base material of their creations and developing new robots made of lightweight materials and inflatable structures that enhance the organic dimension of the conduct of their pieces. The long-term project Strandbeest by the Dutch engineer and artist Theo Jansen is one of the most significant contributions of the past two decades to the debate on the possible paths of convergence between art, science and technology. 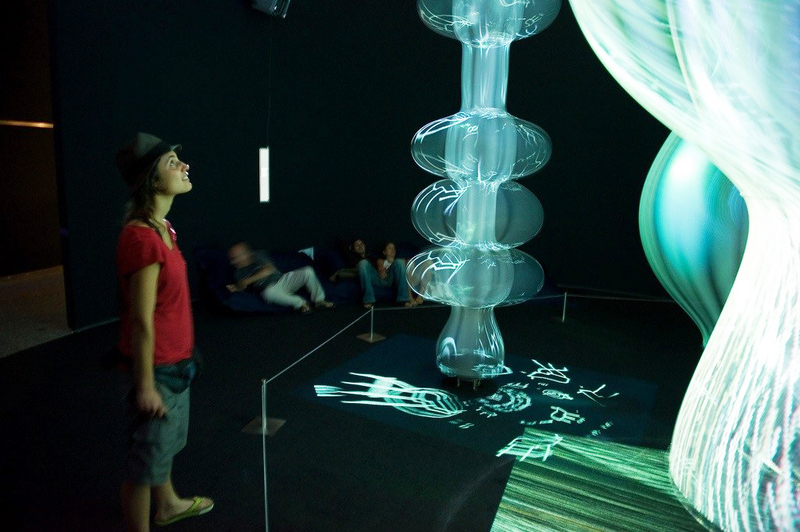 Jansen’s work, which has become famous around the world in the last three years, is important for understanding how the artistic practices that have emerged in the field of new media have repeatedly focused on studying and replicating biological processes in detail for the purpose of building up a repertoire of “life form arts,” which range from the digital simulation of autonomous organisms (“artificial life”) begun in the early 1990s to robotic forms and the ample series of experiments made in bioart, genetics and transgenics. Strandbeest occupies an intermediate space somewhere between advanced engineering, sustainable experimental design and kinetic sculpture, which explains the intense fascination it has generated in the most varied circles. Theo Jansen’s “Strandbeest” (beach beasts) are immense robotic creatures of organic physiognomy and structure whose movements convey a strong impression of life. 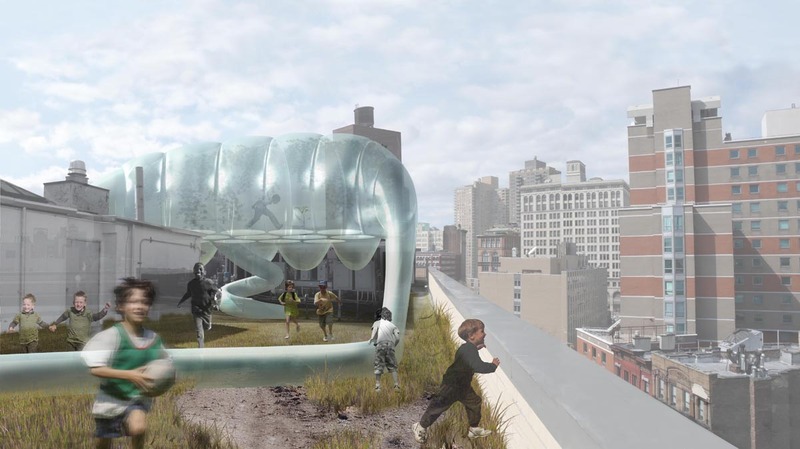 From a distance, they could be mistaken for giant insects or skeletons of prehistoric mammoths, but they are made of materials of the industrial age: flexible plastic tubes, adhesive tape. They are conceived in a computer as algorithms, but they do not need engines, sensors or any kind of advanced technology to come alive. They move thanks to the power of the wind and the wet sand found in their native habitat on the coast of Holland. Jansen’s creatures start out as a simulation inside a computer, in the shape of artificial life forms that compete with each other to see which is quicker. Jansen studies the winning creatures and rebuilds them in three dimensions with flexible, lightweight tubes, nylon string and adhesive tape. 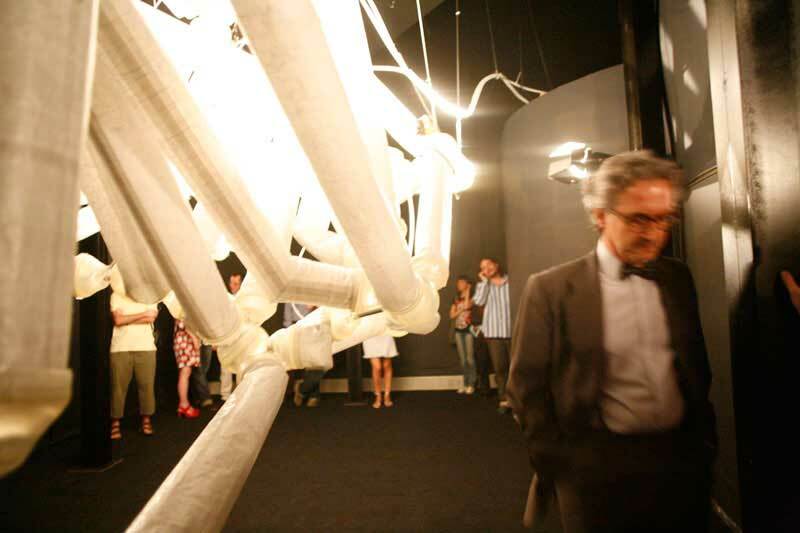 Those that move most efficiently will donate their “DNA” (the length and arrangement of the tubes that make up their moving parts) to the next generations of “Strandbeest.” Throughout this process of hybridisation and Darwinian evolution, the creatures become increasingly more capable of inhabiting their environment and can even make decisions to ensure their survival. For example, the “Animaris Sabulosa” sinks its nose into the sand to anchor itself if it detects that the wind is too strong to keep its footing. 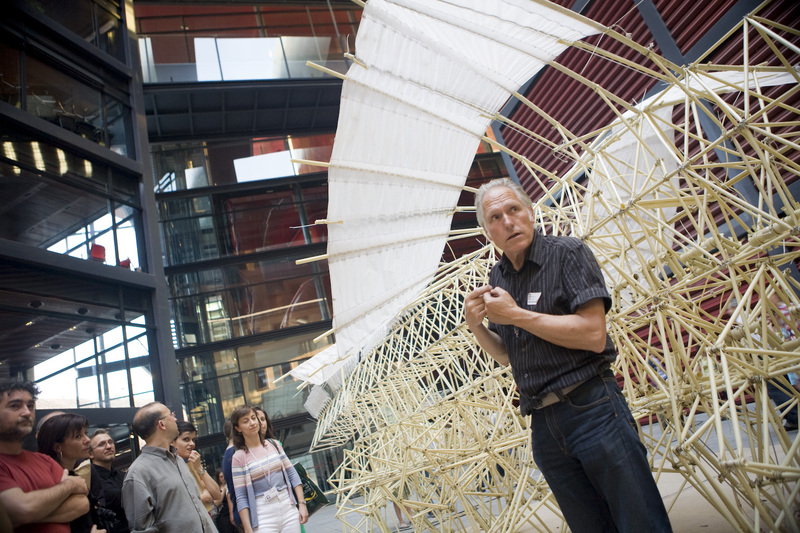 The design process of the “strandbeest” is an example of how the processes and creative strategies that have emerged in the field of digital culture have an impact that goes beyond the screen and pixel and the fetishisation of high technology. Just as there is post-word processor literature, and just as Frank Gehry’s recent architecture would not have been possible before the invention of computer software for calculating structures, so Jansen’s work is the result of the repertoire of procedures developed by algorithmic and generative artists, despite the fact that it pertains to the field of kinetic sculpture and does not make direct use of digital technology. The man who coined the term PostDigital, the Japanese-American artist, designer and educator John Maeda, was one of the most important personages to explore the artistic and visual potential of the computer as a tool and of computer code as working material. 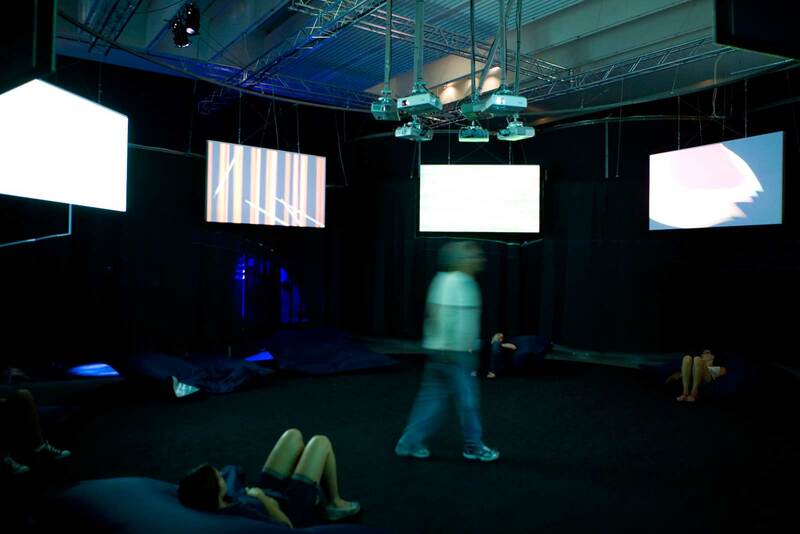 From his position as founder of the fundamental Aesthetics and Computation Group of the MIT Media Lab (1996-2003), Maeda has promoted a humanistic approach to technology that reconsiders our relationship with the digital media, taking the emphasis off the intimidating complexity of the software and instead basing the principles of interaction between computer and user on simplicity and proximity. Maeda, more than any other artist before him, represents a figure that is clearly on the rise in the area of new media: that of the artist-programmer, whose career has been dedicated exclusively to the digital arena and who is also capable of expressing himself perfectly in the natural language of the medium, computer code. Thanks to his hybrid education (he obtained a degree in computer science from the Massachusetts Institute of Technology and a degree in fine arts from the University of Tsukuba in Japan), Maeda was one of the first to understand that, in order to explore the expressive possibilities of the digital media with complete autonomy and without limitations, he needed to be able to work without commercial software tools and technical assistants and dominate the necessary advanced programming languages in order to come up with his own aesthetic vision. Maeda made this idea the cornerstone of his teaching work at the MIT Media Lab. Maeda’s early work is characterised by the introduction of a poetic, humour-filled sensibility in digital pieces that, visually speaking, were clearly related to 20th-century pictorial movements such as Suprematism. One of his best-known works, The Reactive Square, clearly expresses his commitment to simplicity: a black square that alludes to the famous piece by Malevich dances and changes shape in response to the sound of our voice. The series Nature is a renewal of aesthetic vision through what has been called “post-digital,” an approximation to the dynamic spirit of Abstract Expressionism that incorporates organic elements and dynamics and a fascination with the processes of nature into the digital plane. Throughout the 1990s, the most popular theory regarding contemporary art highlighted the role of art as a generator of interactions between visitors-users that went beyond the paradigm of contemplation, as in Nicolas Bourreaud’s famous Relational Aesthetics. Meanwhile, the digital community was experiencing a similar phenomenon enhanced by the success of the Web 2.0 label, which views the work of the digital designer basically as that of channelling spaces of participation that encourage collective creation. 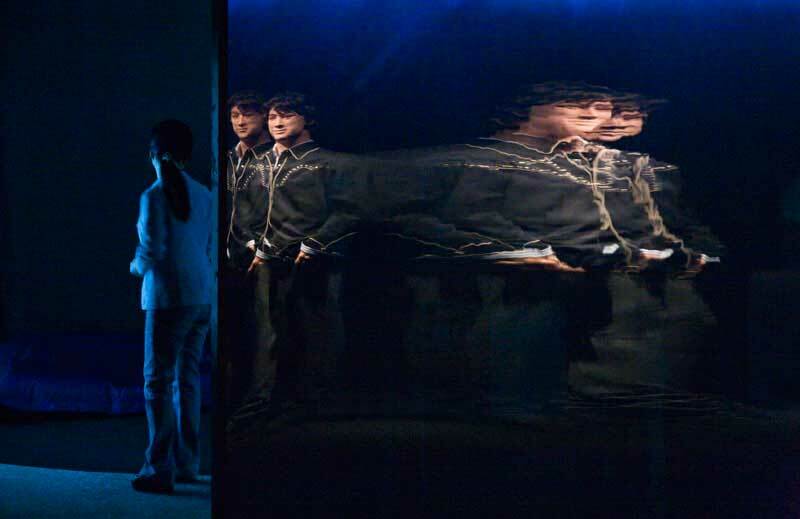 It is easy to link the two episodes using another of the formal solutions favoured by digital artists: that which views the work as a tool, which must be appropriated by the user-spectators in order to realise its full potential. A clear example is the work of Evru in the area of software. For his participation in Souls and Machines, Evru will propose the creation of a workshop space in which the visitors to the exhibition are the protagonists by making use of two creative software tools for painting and writing developed by the artist over the last decade. Tecura, one of the longest-running projects of Evru’s career, proposes using software as a vehicle for investigating the therapeutic abilities of the creative act. The software presents an alternative vision of the syntax of commercial drawing programmes, reinterpreted according to the keys of Evru’s aesthetic universe. For this new version of Tecura, the artist intends to give visitors the ability to operate on and digitally modify key works in the Reina Sofía collection. The area assigned to Evru in the hall is arranged like a real permanent workshop, where numerous computers with Tecura installations will invite visitors to generate works that will then be printed and will gradually take over the space. The hall monitors will help visitors to explore the tools and encourage them to take the initiative and, for a few minutes, cease to be mere spectators. The “architectures of participation” and the socialisation of the spaces and tools of the postdigital era are, in a way, the logical and inevitable conclusions to Souls and Machines, represented in the social networks generated by Antoni Abad in his work-in-progress Zexe.net and in the environmental health clinic of Natalie Jeremijenko, an open resource centre that aims to offer specific solutions at the local level to the multiple problems caused by the climate crisis. Now that we have transcended—perhaps definitively—the construction of techno-utopias, the practices, languages and strategies grouped together under the imprecise label of “new media” are today, above all, a space of possibility and a directory of proposals for action.